So, maybe I’ve ruled out competing in the Games (at least this Olympics), and after reading the Frugal Traveler blog from the NY Times, I might rule out going to Whistler entirely. I’m not giving up hope on getting there; I actually have more hope now. 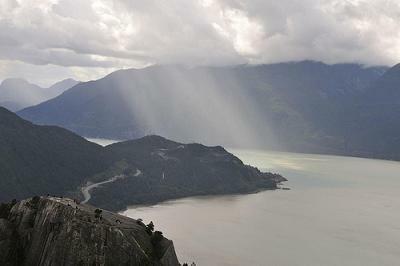 I’m going to Squamish, B.C. An hour north of Whistler is the simpler, cheaper, and more relaxed alternative. All my style. The outdoor playground has Stawamus Chief or “The Chief,” the more accessible Canadian version of Yosemite’s El Capitan, along with stellar hiking, mountain biking, birding. Plus, during the Olympics, free shuttles will give ticket holders a lift along the Sea-to-Sky Highway, an amazing trip itself. Rooms at nearly half the price of Whistler, catering towards the locals rather than “well-heeled tourists,” and with beer just as cold, Squamish may be where it’s at.